Personalized Deck of Playing Cards Just $5! 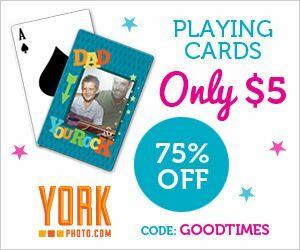 You are here: Home / Great Deals / Personalized Deck of Playing Cards Just $5! Through July 9, you can get a personalized deck of playing cards for just $5 ($19.99)! And, as a new customer to YorkPhoto.com, you will also get 40 FREE photo prints. Choose one of their designs or create your own and enter promo code GOODTIMES at checkout. Shipping starts at $3.99. And, don’t forget about Father’s Day coming up. How about this as a unique gift for dad?